Railway RRB Group D 02/2018 Online Form – Apply Online for Railway Group D at rrbonlinereg.com: Railway Group D Online Application form. Are you Looking for RRB Online Application form? Railway Recruitment Boards (RRB), Government of India, Ministry of Railways have invited online application for Railway Group D recruitment for filling up 62,907 Group D posts through Central Employment Notice (CEN) Notice No. 02/2018 vacancies under Railway Recruitment 2018. Candidates willing to apply for any Railway Recruitment Boards (RRB) including Railway Ahmedabad Board, RRB Ajmer, RRB Allahabad, RRB Banglore, RRB Bhopal, RRB Bhubaneswar, RRB Bilaspur, RRB Chandigarh, RRB Chennai, RRB Gorakhpur, RRB Guwahati, RRB J&K, RRB Kolkata, RRB Malda, RRB Mumbai, RRB Muzaffarpur, RRB Patna, RRB Ranchi, RRB Secunderabad, RRB Siliguri and RRB Thiruvananthapuram for Track Maintainer Grade-IV (Trackman), Pointsman, Gateman, Helper, Keyman and various other Posts in Level 1 of 7th CPC Pay Matrix against RRB Notice No. 02/2018. Follow the instructions below to apply online for Railway Group D recruitment. Indian Railway has started appointment of above vacant posts in various Railway Zone under Railway Recruitment Boards (RRBs). Eligible and interested candidates can apply only through online mode from 10-02-2018 to 12-03-2018. Follow the instructions we have explained below which teaches you how to apply online for RRB Recruitment 2018. Railway RRB Group D Online Form Click here. 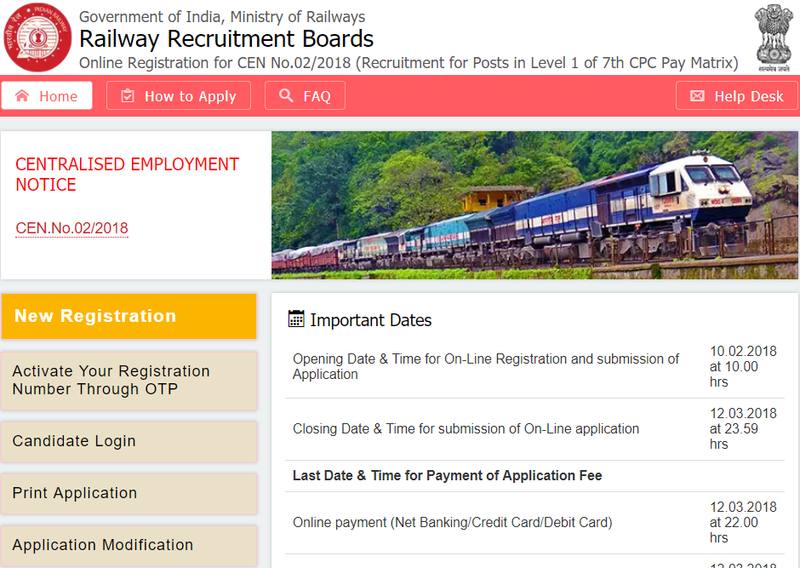 Railway Online Application Form: All those candidates who wish to apply for various Group D Posts in Level 1 of 7th CPC Pay Matrix in Indian Railway through Railway Recruitment Board (RRB), they are required to fill online application form on its official website at http://rrbonlinereg.in/. Follow the below link for post wise application form. How to Apply Online: In order to apply online for RRB Group D Recruitment, candidates are required to apply only through online mode like other competitive examination. We have come up with each and every detail about RRB Online application form and how to apply online for Railway Group D Vacancy. 1. Registration: Click on the “New Registration” Button below if you are Registering for the first time. 2. 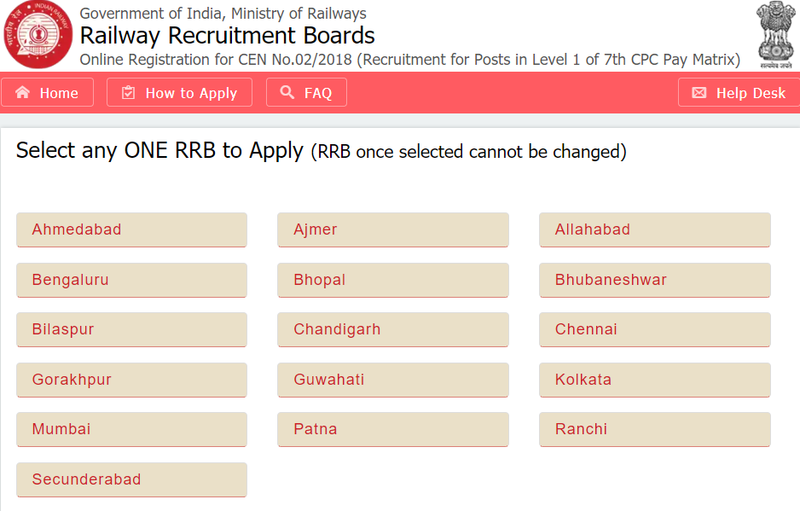 Select The RRB: Select the RRB to which you would like to apply. Please be aware that, RRB once selected cannot be changed after registration. 3. Registration Details: Fill up the basic details viz. Full Name, Father’s name, Mother's Name, Date of Birth, State, Mobile number, E-mail Id, Aadhar number etc. Complete the Registration process by filling all the details for generating a Registration Id & Password for login and OTPs (One Time Password) for validation. The Registration Id and password will be displayed on the screen. OTPs will be sent to your registered mobile number and E-mail id. 4. Verification of Mobile & Email: Retrieve OTPs from mobile number and E-mail and validate them by clicking on the “Verify through OTP” link to proceed with the filling up of application. 5. Part I of Application form: Click On ‘Candidate login’ option on the screen. Complete the Eligibility Criteria Form and Submit. Provide the details of Educational qualification, Community, Gender, Religion, ExSM, PWD, CCAA, Minority, Economically backward class, Age relaxation eligibility category as applicable and other details. Before submitting the Eligibility Criteria Form, be sure that all the information is filled correctly. After submission, you can modify only by Paying the modification fee of Rs 250/-. Step 6: After submission of Eligibility criteria form, make the Payment by clicking on the Payment tab. Only after payment you will be able to fill the additional details and upload Photos etc. 1)Bank: Net Banking /Credit card/Debit card etc : Select the mode of payment of fees from the options available such as Net Banking, Credit Card/Debit Card etc., Enter the details required on the relevant option screen and submit the payment. After a while you will get the payment response as "Success" once bank has received your fees, or else a "Failure" response will be displayed on the screen along with the reason for failure. 2)Post Office: For Payment through Post Office, Select Post Office from the drop down and Click the button to proceed for generating a Challan. Take print of the Challan and pay the fees in the nearest computerized post office. Part II of Application form: After successful payment, fill preferences for posts and choose Choice of Exam Language other than Hindi and English. Now, complete the remaining application form by filling up additional details and Photo(s)/Document(s) Upload. Before uploading photo with name & date printed on it, be sure that the scanned photo is as per the sample photos by clicking the same available below the browse button. Final Submit: In the end candidates have to confirm the declaration by clicking on “I hereby declare that I have gone through the eligibility criteria for the posts. Now, the entire application shall be displayed for confirmation once again and on confirmation, the candidate may take the print of the application and preserve it for reference and record. #. Candidates are advised to keep at least 12 (Twelve) copies of the same photograph for further use as and when required during the recruitment process. #. Candidates belonging to SC/ST have to upload scanned copy of their SC/ST certificates (JPG/JPEG format, 50kb – 100kb) also for availing the facility of free travel authority (Second Class Railway Pass). Note: Even after final submission, it can be edited only by paying the modification fee of Rs 250/- . Modification can be done only twice. Hence before submitting eligibility criteria form and final application submit, be very sure of the correctness and then submit. Candidates are advised to read instructions carefully and then Apply Online for RRB CEN 02/2018 Railway Group D Posts 2018.